Now in our 13th season, Showtime Performing Arts Theatre is a fully-equipped, two-story, state of the art 120 seat teaching and performance facility presenting a full season of children’s and adult musical theatre and plays each year. Separate spaces include performance stage, a dance studio with mirrors and separate sound system, rehearsal studio with piano and backstage area. 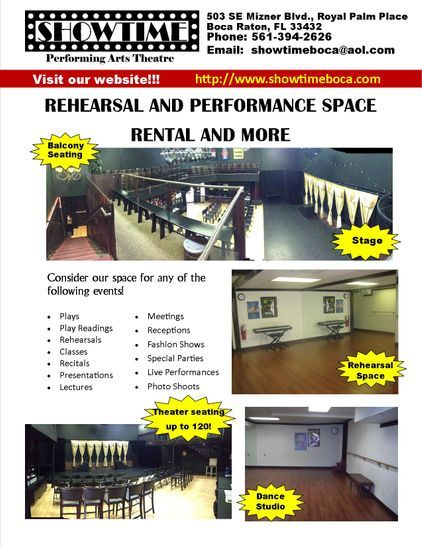 For more information about renting space from Showtime contact us!! Watch an afternoon play performed by our talented actors on the SHOWTIME mainstage for you and your guests, then enjoy meeting with the actors after the show! Performance is approximately 1 1/2 -2 hours followed by 30 minutes in our party room after the show for pizza and beverages. We supply the paper goods, all you need to bring is the cake!! 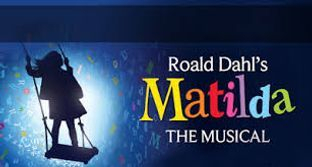 *Only available when SHOWTIME productions are being performed, Saturdays from September - May. 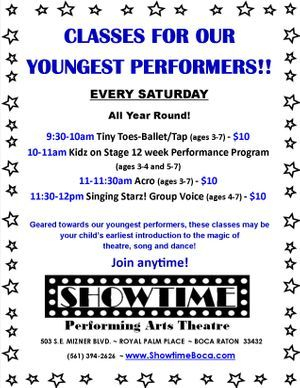 Call us at 561-394-2626 or email showtimeboca@aol.com.